Probably my second favorite British media cliché is what I call "the tea story". It turns up every few months, and usually extols the fantastic health benefits of the national beverage, as if there were anyone in the British isles who didn't drink enough tea. Sometimes though, a mildly scary tea story appears... as if one could possibly discourage anyone in the British isles from drinking tea. Today in on the BBC, came this story: tea 'healthier' drink than water. However, just a couple months ago, we learned that tea's health benefits are 'exaggerated', which I find interesting because the photo appears to be exactly the same cup of tea as in the more recent story. Earlier still, we found that making your tea in a teapot 'is the healthiest option', but you really don't want to be so traditional as to put milk in your cup, since milk in tea 'blocks health gains'. And what exactly are the health gains of a nice cuppa? 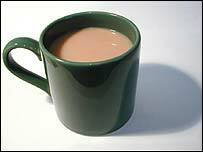 Well, tea 'could cut skin cancer risk', and for that matter, tea 'controls female hair growth'. When we return to our stock photo of a cup of tea with milk again, we learn that black tea 'soothes away stress', and amazingly, the same cup, which must be getting cold by now, 'reduces ovarian cancer risk', 'may fight tooth decay' (but don't try herbal tea for that, just regular tea, thank you), helps fight off infections, and we even learn that scientists in the United States now believe that the health benefits are so great that everyone should be urged to drink tea, and that doctors say heart attack victims may live longer by drinking plenty of tea, but not too much, because, not surprisingly, tea 'increases incontinence risk.